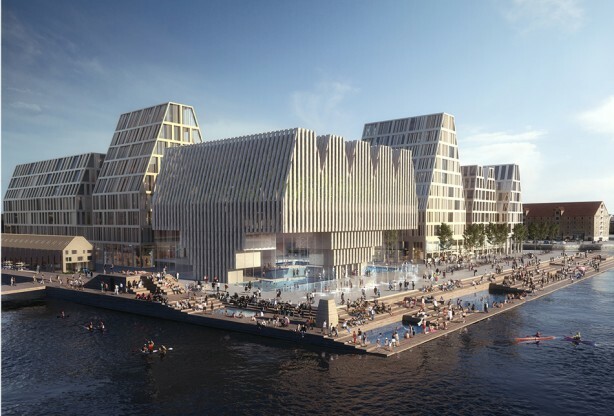 In the heart of Nordhavn lies the historic port of Copenhagen, Kronløbsøen. 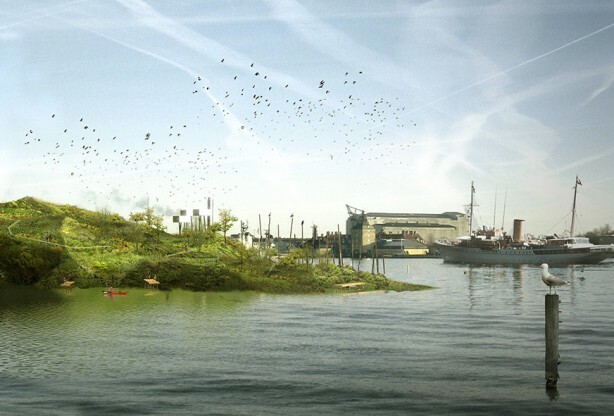 A new island rising from the harbour as an alluring mirage, marking the transition between port and city. 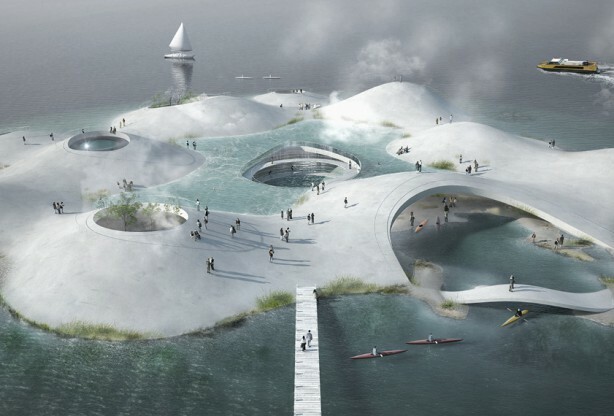 The ambition was to create an island that could accommodate and celebrate all aspects of harbor life – sailing, swimming, fishing, sitting and socializing – where the public spaces and architecture mediate between monoliths. The Harbor is the city’s stethoscope, listening to the world through the rhythm of the ship docking. The Harbor is the city’s curtain, a membrane of reflected distance in the inlet’s shifting nuances. The Harbor is the city’s herb garden, here slipway bathes in the smell of tree, pitch and salt during summer. The Harbor is the city’s hands and arms, reaching out into the ocean of Braille. The Harbor is the city’s memory, where the sleeping and the dead meet under the surface of the water. The Harbor is the city’s scene, lit by arrival and departure. The Harbor is the city’s balcony, a front seat of a view over the horizon. The Harbor is the city’s feet, driven down in between the sheet pilings angles. The Harbor is the city’s eyes, looking towards one spot that never changes. The Harbor is the city’s compass, persistently navigating back on track after the rotation of a day. The Harbor is the city’s dialyzer, filtering out the small things out of the day. The Harbor is the city’s light and dark, it incessantly humming like a machine, the ocean. The Harbor is the city’s ballast, dock, slipway, wharves, and coast. Here everything strand its ground. self-grown initiatives and creative business’. 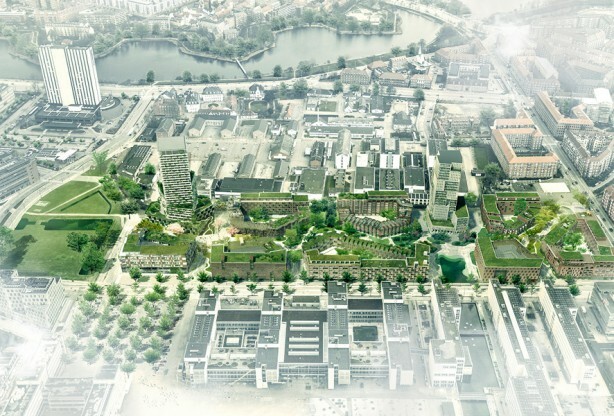 Kronløbsøen will shape its own history from the bottom of the basin. 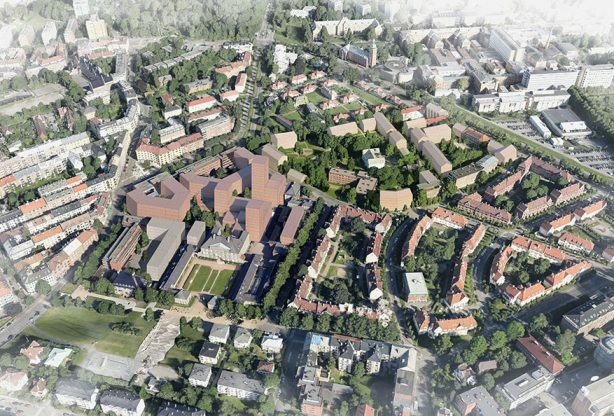 The development of the Århusgade district and Sundmolen with their own identity makes up the contrasting areas to the new community on Kronløbsøen. 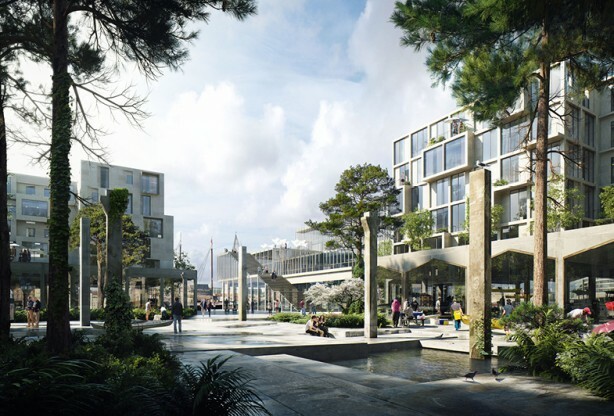 A Multi-family residential area with unique qualities, that interacts with the varying urban spaces and eventful shore sides drawing out the best of the city for the benefit of the island’s residents and visitors. 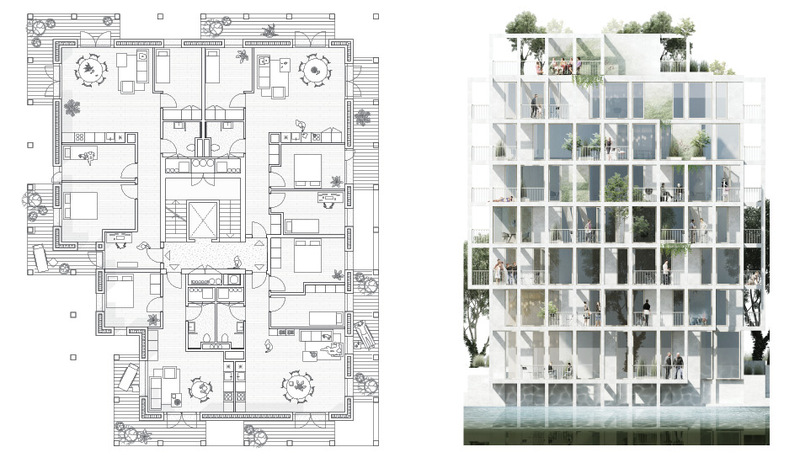 apartments emerge with a direct, dual view to the surrounding water and harbor infrastructure, whilst offering varied spatial experiences inside and out. 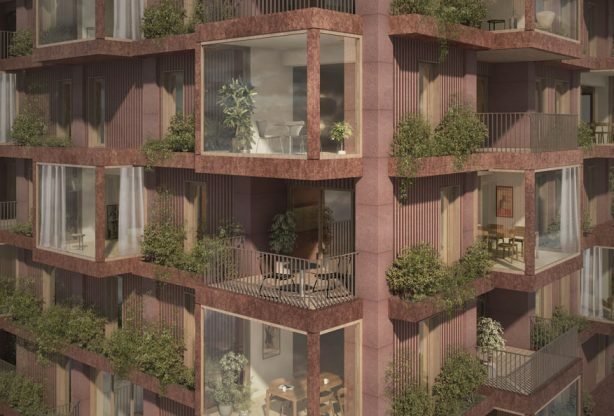 A network of balconies create a canvas for residents to populate – an inviting and dynamic facade treatment that gives hints of everyday life through selective transparency. 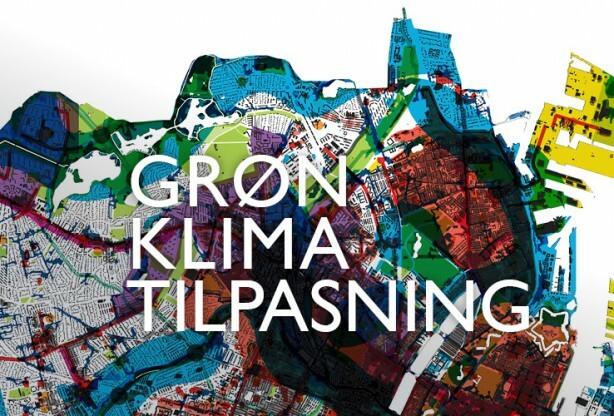 Kronløbsøen will take its offspring from the biggest quality of the islands shape – the surrounding water. Each side has a unique relation to the water, from the larger shoreside spots to small intimate channels. The distinctiveness of the area, featuring the waters sensational and visual quality, will be maximized to its full potential. 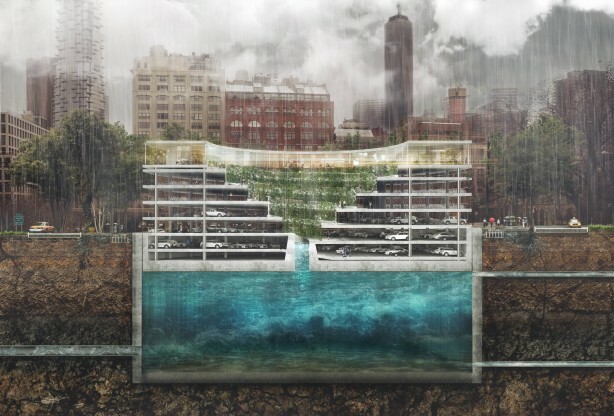 In our opinion it is therefore a prerequisite that each apartment has two different views over the water. 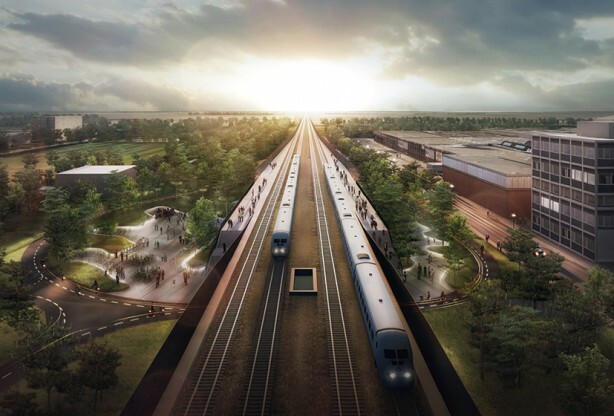 Not just to create a sense of wellbeing and wellness, but to emphasize the identity of the area. You do not just live by the water, but alongside with the water. 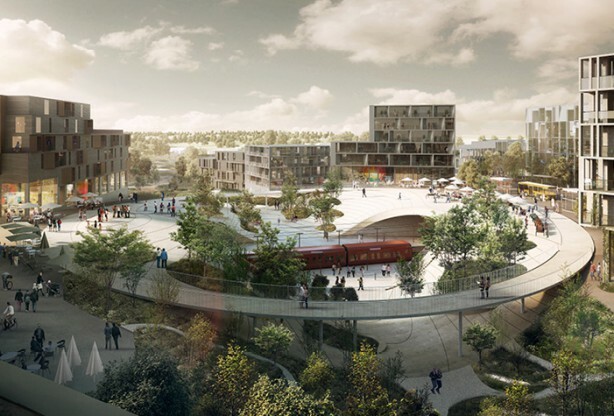 We see Kronløbsøen as a Sierra which takes its shape after the optimal disposition in regards to the apartments, amenity and how they are in connection to each other. 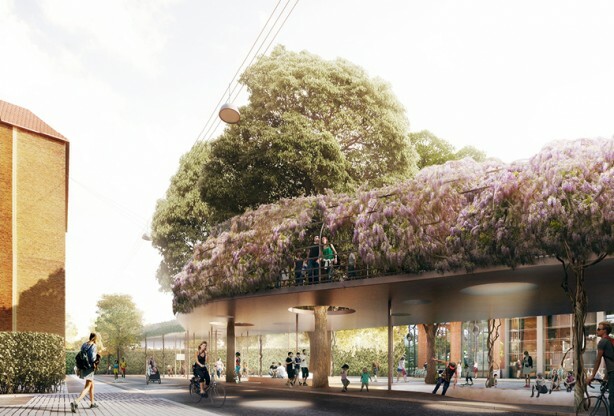 All in all the buildings and the urban spaces will be taken into consideration in regards to each other and the way we move around these urban areas. 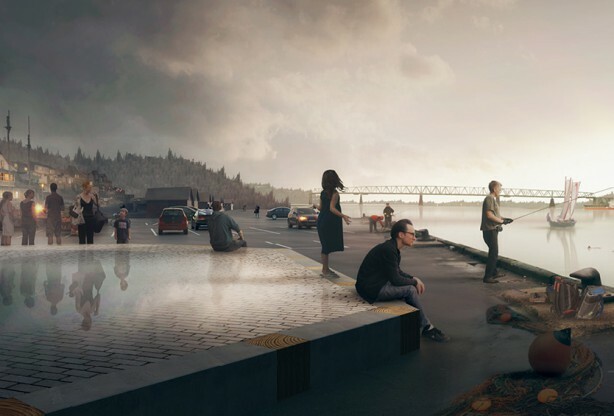 The island will be divided through the use of several justified and rational principles which will consist of 8 solitary buildings and just as many urban spaces – all with maximum view and varying spatial experiences. 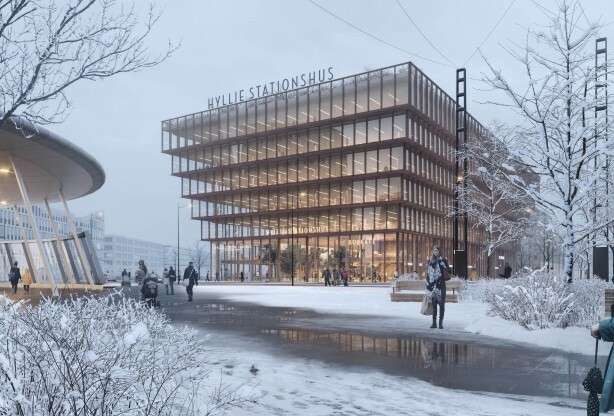 Instead of looking at the city and buildings as objects on a flat surface, we look at Kronløbsøen as an exchanging state of coherent structures and plateaus with the buildings and urban spaces as large actors. Architecture does not work as an empty shell where we can be outside of it or inside. It is a poros and variating network that together makes up the framework for the good life. 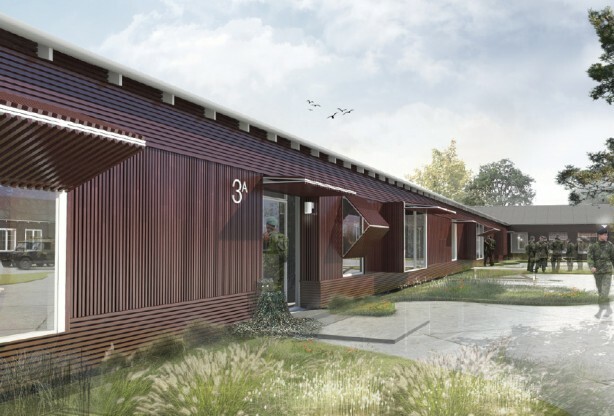 The offset multi-family residential appears as a programmed composition of varying and intimate niches that at the same time keeps the overall look as a holistic area. This principal we use throughout the plateaus as well as a sections. Notches, inflow of light and offsets are defined in each volume which partially marks the island’s primary flow and contributes to creating intimate spaces for temporary stays. The principals for this comes from having a view along with the microclimate parameters for optimizing the daylight and wind conditions. 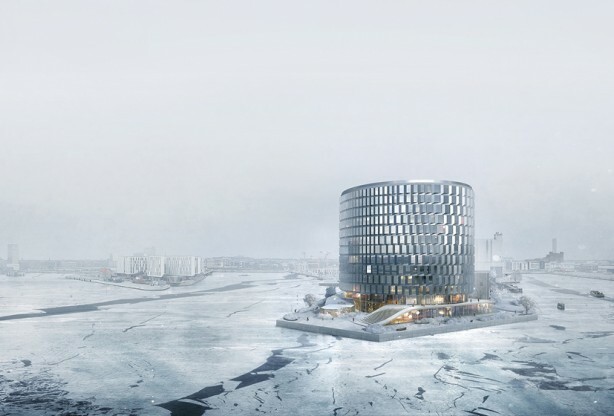 Kronløbsøen will appear as an overall and sensual tableau which though its pragmatic parameters goes in dialog with the harbor’s other monumental objects. 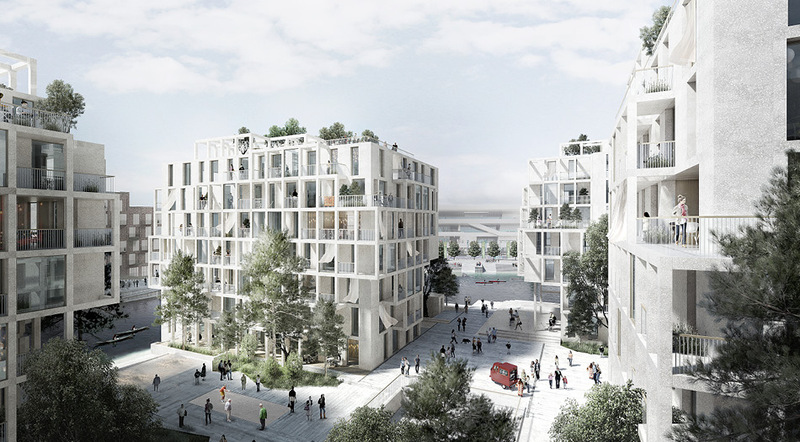 Inner Nordhavn is based on a crystal clear and strong district plan that anchors and challenges the new multi-family residential on Kronløbsøen. 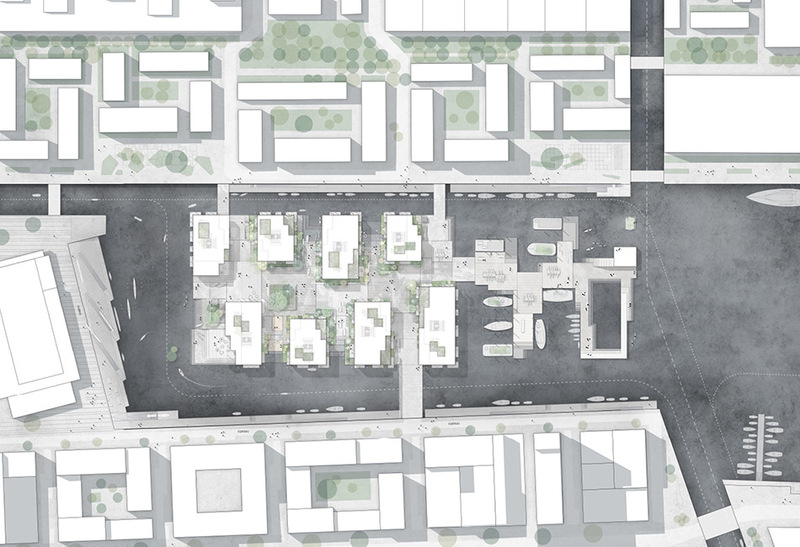 The islands context is affected by productive opposites and consist of multiple typologies and size. The Århusgade district for example has many joined types of facades in reddish, earthy nuances and Sundmolen with its many scales of warehouses and newer block buildings with inner yards. 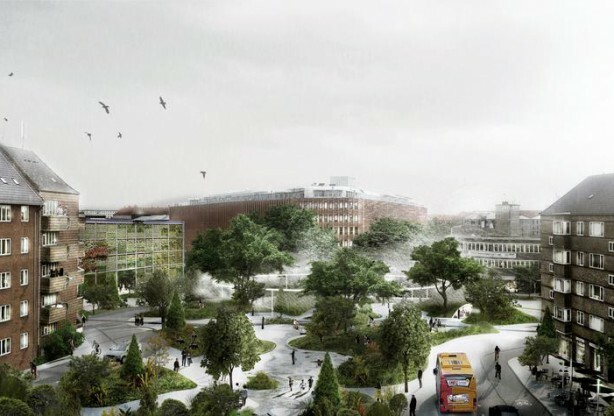 Kronløbsøen takes a natural stand for the demands and wishes to a one of a kind Specificity in regards to its neighbors as well as setting the stage for unique viewpoints from all apartments, establishing intimate urban spaces and last but not least an upgraded parking lot with 1001 parking spaces. 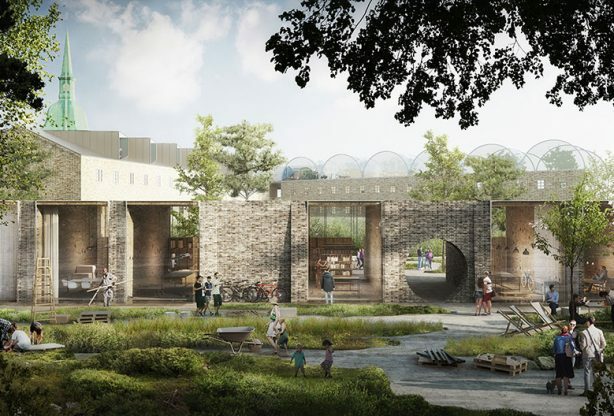 Our vision for Kronløbsøen is to create a place where architecture, water and the greenery shapes a strong social atmosphere that is beneficial for extroverted social gatherings and a good everyday life for the families. The main ingredients for this is diversity and composition in an overall structured sense. 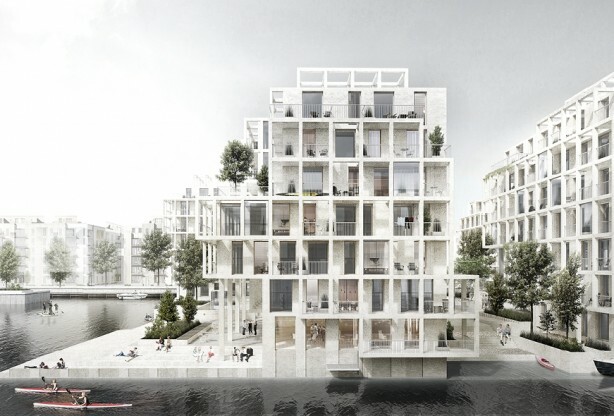 Kronløbsøen so to say sneers the classic apartment block inside out with the intention to continue develop the harbor as a common matter that is for everyone’s benefit. 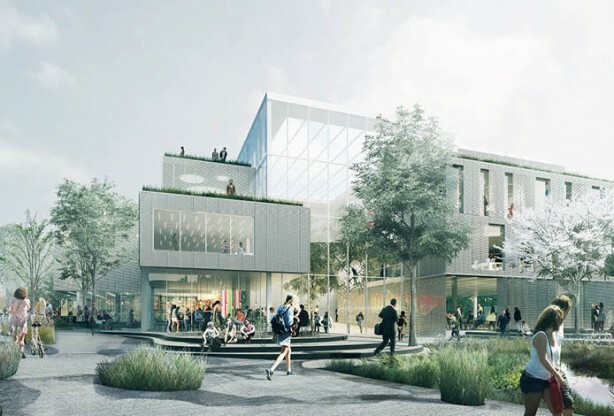 The facade and the shore side will be activated and be the places where people meet criss-crossing across the community. 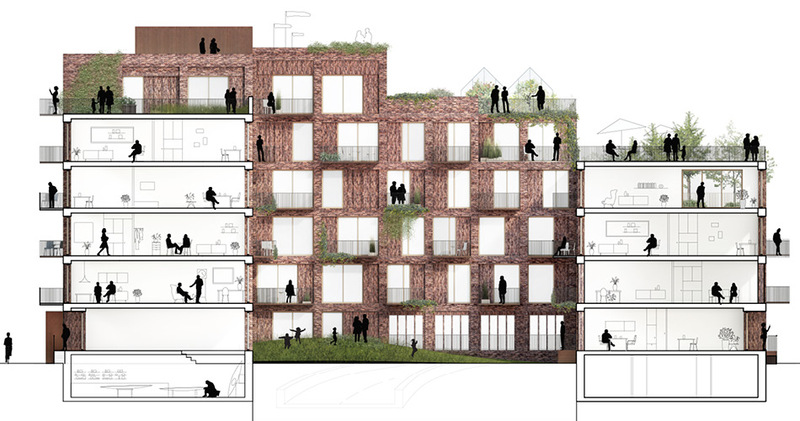 This has been the essence in the reevaluation of the classic apartment block on Kronløbsøen. 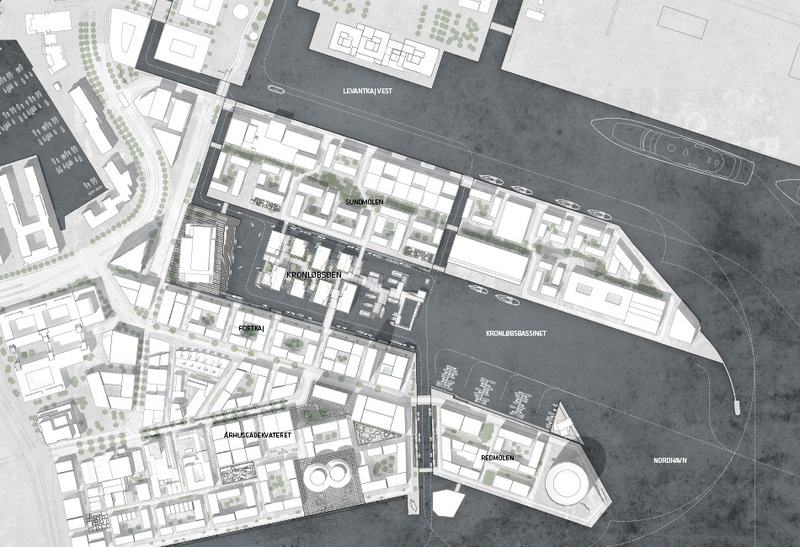 Our want to add a new history along with different typologies that takes place within the same rational framework as the harbor related history. 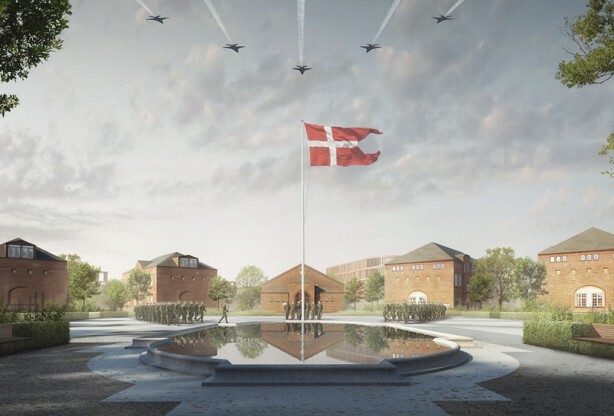 At the same time this island will offer Nordhavn and Copenhagen a one of a kind residential island with an outstanding everyday life. 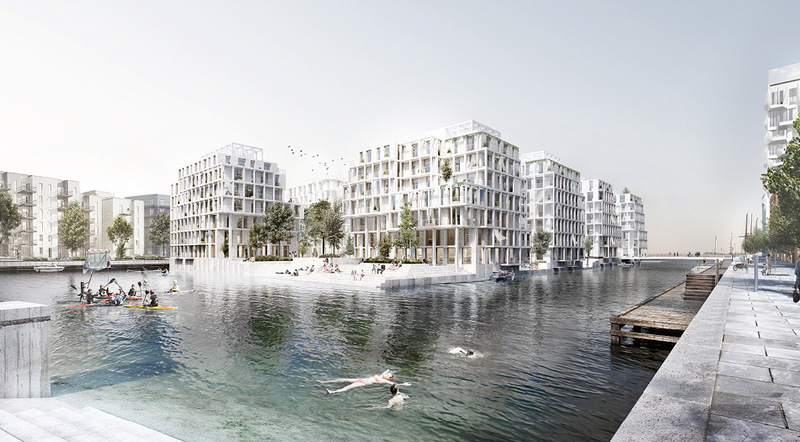 WIth this one of a kind opportunity to build an artificial island, it is obvious to accustom Krønløbsøn a vigorous design by molding the urban spaces, residential area and quays with maximal contact and outlook over the water. Our ambition has been to build a multi-family residential which supports the architecture that captures the the areas rustic history with its contour and material. 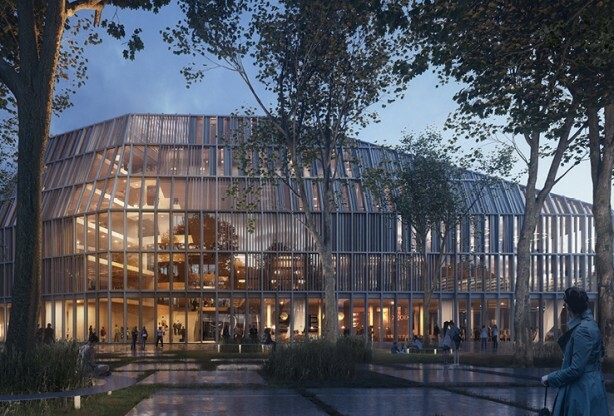 The architectural style will be a contrast to the complex and varying context by having a homogeneous facade and a continuous characteristics throughout the area. 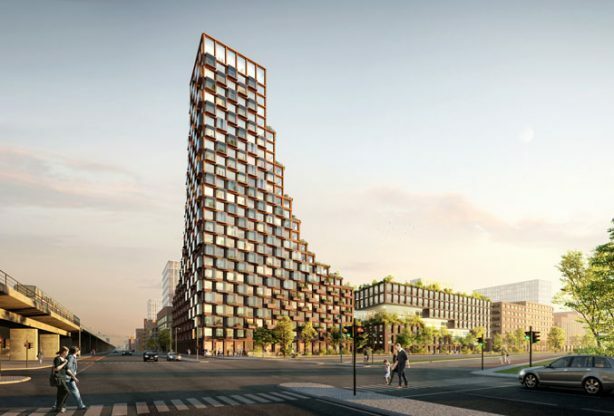 The sculptural multi-family residential will create variation and dynamic throughout the facades by having both high-, low-, narrow- and more transparent buildings. 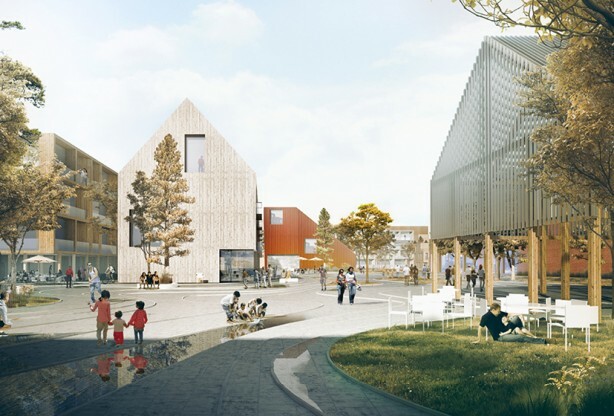 Kronløbsøen will be a place which can draw out the best from the city – a place where there is space informal meetings and versatile activities for all ages. At the same time we think it is an important parameter to establish private and semi-private outdoor areas for the residents of the island. Around the multi-family residential area there will be private front areas, at the ground floor level, with a unique alteration of the shore sides. The short sides will exude with lushness and have a great variation of plant choices. 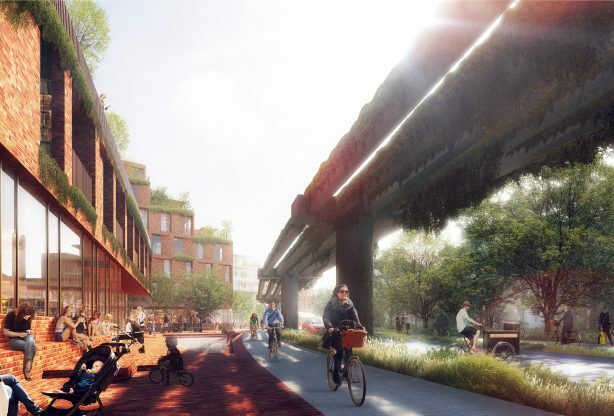 This will furthermore have an impact on the green areas around inner Nordhavn and the biodiversity for Copenhagen in general. The prime locations in the harbor are placed along the central ground level deck and arranged in a way so that all is oriented in relation to the sun, sheltered from the wind and adapted to the way people naturally move around and meet up. The plants are put together with a desire to have a large diversity, low maintenance, variation of size and in consideration to the special properties. 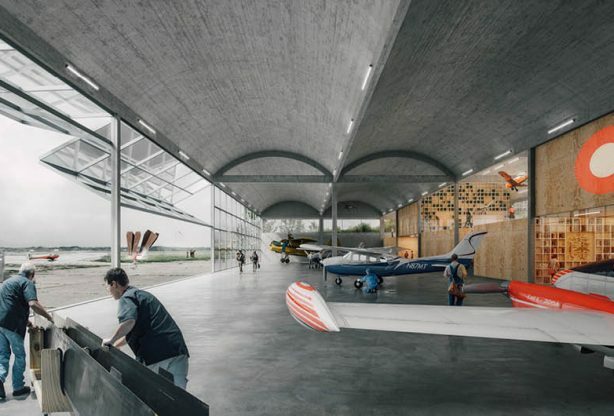 A key component for us has been to assure to make a pathway to the water by establishing a sense of security and space for activities, a temporary stay and playing by the water. 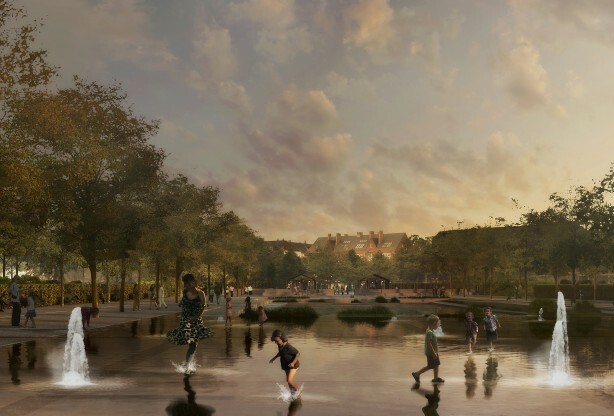 We have a wish to enhance the recreative roles of the water and harbor through a variation between the water, urban spaces and promenade as well as the gardens, shore sides and buildings. Being able capture the many different activities in the harbor we have a varying height from the edge of the quay to the surface of the water. 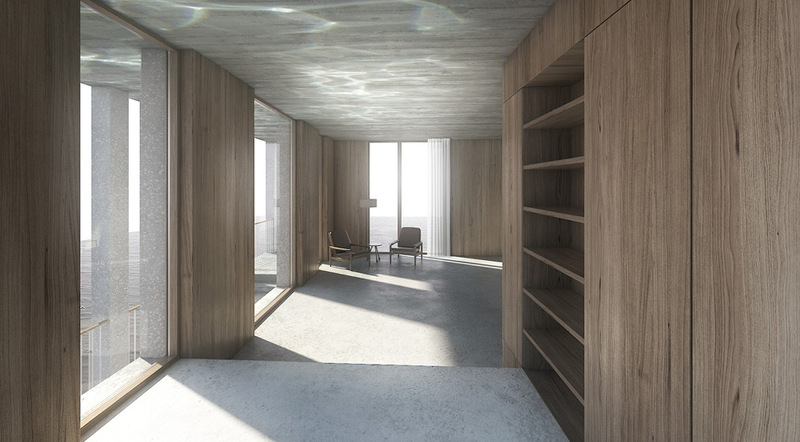 The Semi-private channels will have small spaces with stairs down to the water. Here one can enjoy the sun and meet up for lunch whilst looking at the life around the harbor. This will be a closed off space having an amphitheater effect where residents and guests can enjoy a temporary stay away from wind and rain. wall shrubs and climbing plants giving the island a greater sense of smell and a large green volume. 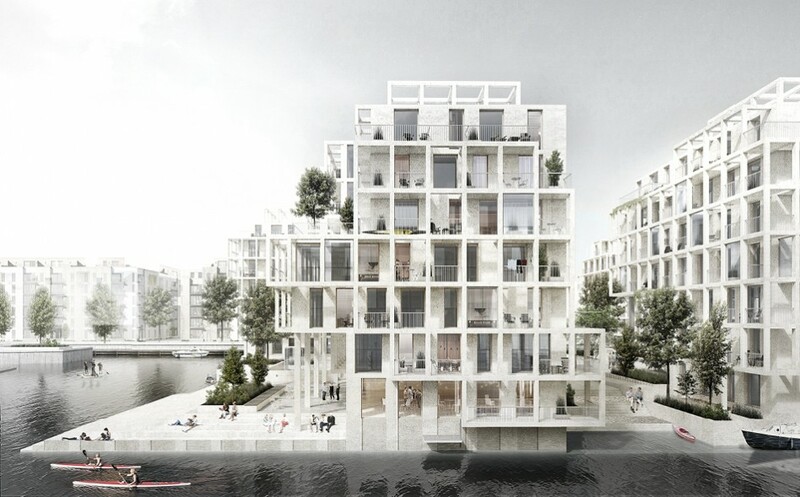 The buildings livable facades “Grow” out of the Monoliths mass giving the individual apartments greater balconies in extension to the room and living rooms. These accommodations can be like the more classical style balconies or as unheated winter gardens depending on the orientation and type of apartment. 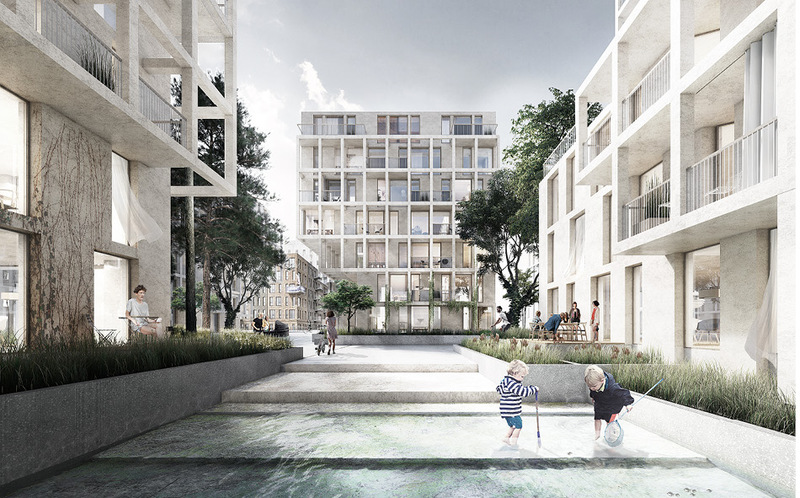 The idea is that the residents can have an impact on how the facades should look as time passes. This will allow the life to reflect the surroundings. clear relations to the water and names from their location, function and atmosphere. 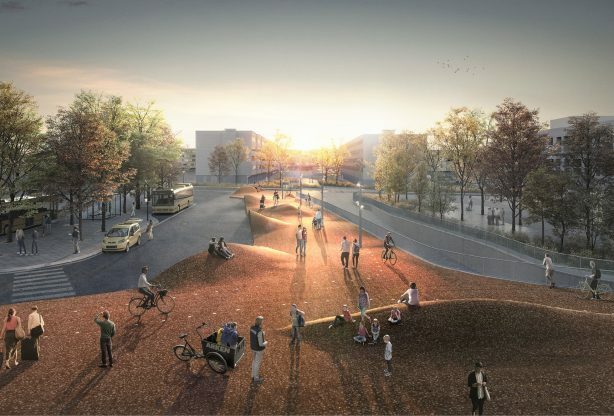 Kronløbsøen’s landscape and queries are shapes with different staircases and plateaus in varying surfaces relating to an active integration with the water – which can either be for kayaks, larger boats, bathing or having a break from the everyday life. 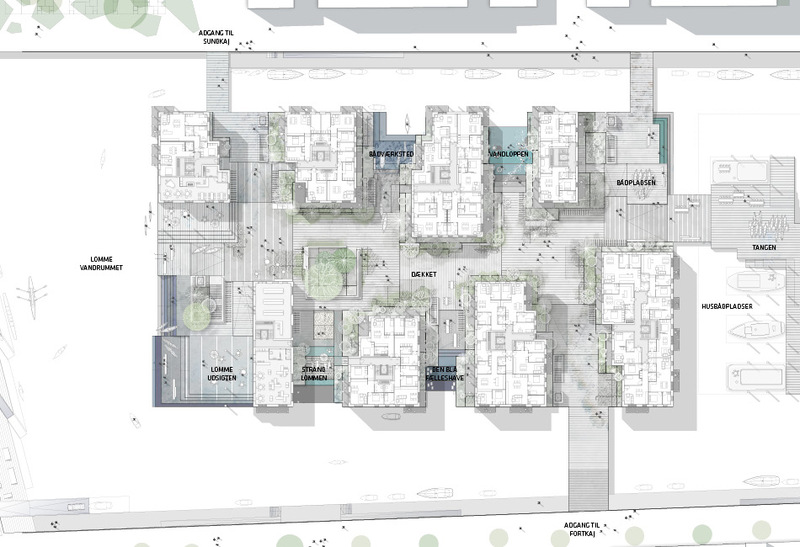 By making the residential area on the basis as a Multi-family residential a more attractive framework is created for the individual residencies. These are very closely primarily placed on the corner with a view over the water and have outdoor spaces in several directions. The multi-family residential therefore is not open towards the back of the apartment, but offers a pure view over the water and the surroundings in all directions. This principal secures that all living rooms, placed towards the edges of the apartments have sunshine coming in from several directions throughout the day. The different apartment types are predisposed scattered around the residential area, so that all floors offer different sizes of apartments. 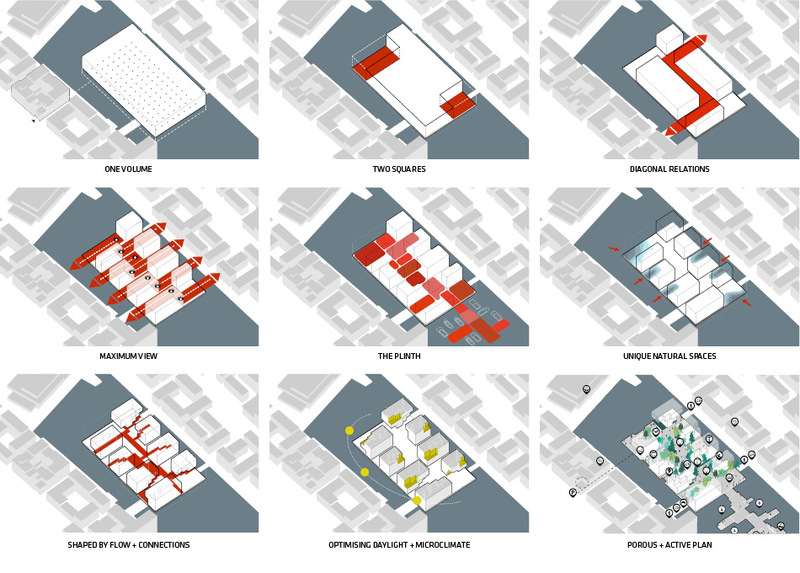 By doing this it ensures architectural diversity and a mixture of apartments as well as residents. All the windows are floor to ceiling, which lets the daylight fall through far into the apartments as well as giving a marvelous view out on the surroundings. 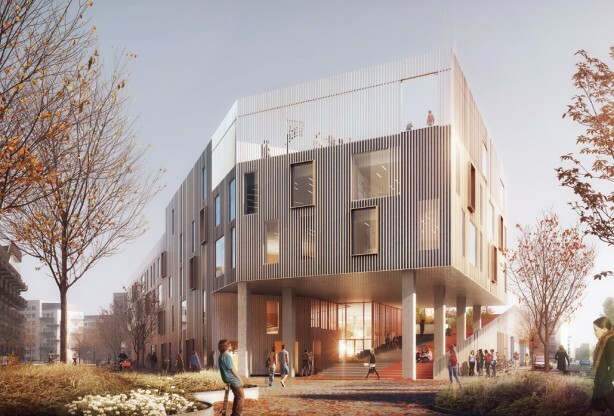 In addition there will be sliding doors, so when the weather allows it, the residents can extend the length of the room out on the terraces. These can change into classic balconies or as unheated winter gardens depending on the orientation and the type of apartment. 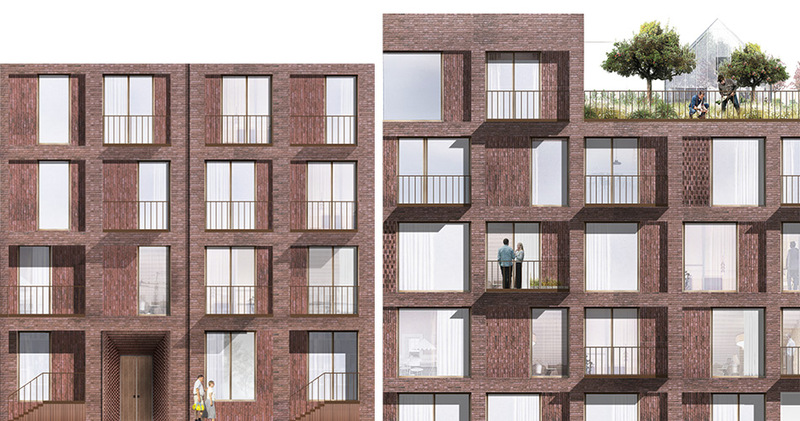 The idea is that the residents can have an impact on how the facade looks over time. This way the life in the area can have a refection on the surroundings. g with 6 stairways which gives access to 2-4 apartments pr. stairway landing.The apartments in general have bright ground levels with well known plan solutions along with rooms from 2-5 depending on the type. 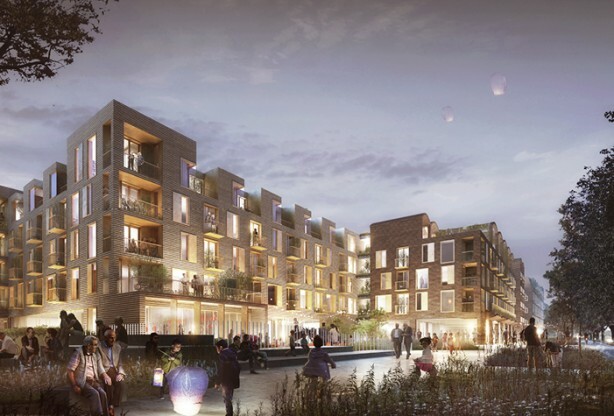 On the corner of the buildings the larger apartments will be placed with a living room getting light inflow from two directions in comparison to just one shining through the apartment and a view over the yard. In the stairway there will be elevators and trash shoots from well known principles.